NETWORK FINALS: THURSDAY NIGHT FOOTBALL adjusted to 4.8. In addition, GREY’S ANATOMY and THE BIG BANG THEORY gained 0.1 in final numbers. CABLE HIGHLIGHTS: NFL Network had to share THURSDAY NIGHT FOOTBALL with FOX, pushing the cable part of the game’s rating down by 1.93 to 1.11. Not surprisingly, the news dominated the rest of the Top 20, with 16 of the slots going to one form of coverage or another of the Senate Judiciary Committee hearing. 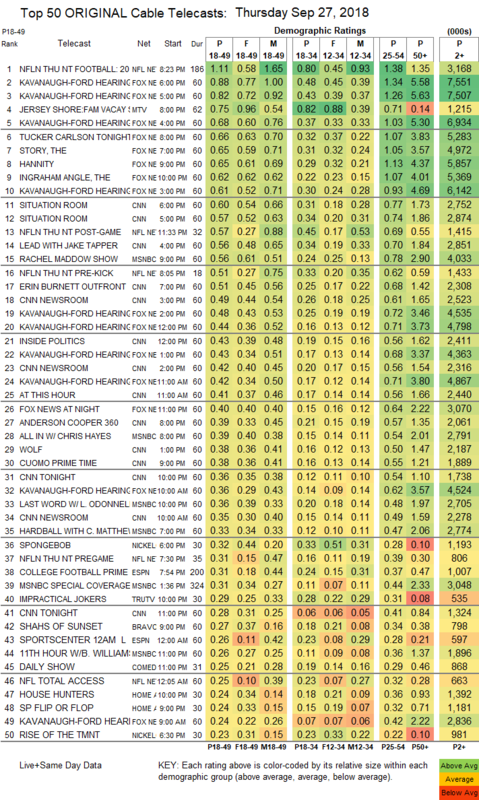 The top numbers for each network were 0.88/1.34/7.6M for Fox News in the 6PM hour, 0.60/0.77/2.8M for CNN in the same hour, and 0.56/0.78/4M for MSNBC’s RACHEL MADDOW SHOW. MTV’s JERSEY SHORE, amid all that, ticked down to 0.75. Nickelodeon’s SPONGEBOB was at 0.32. 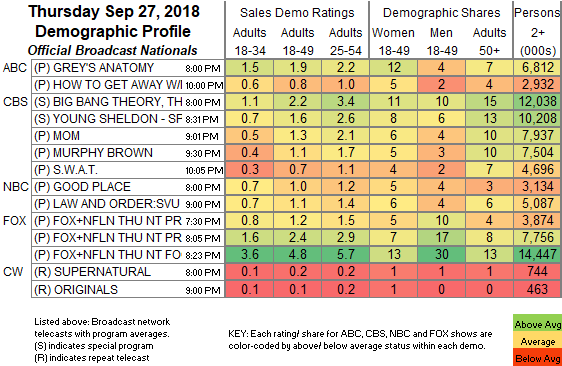 Tru’s IMPRACTICAL JOKERS was steady at 0.29. Bravo’s SHAHS OF SUNSET slipped 0.02 to 0.27. On HGTV, FLIP OR FLOP lost 0.02 to 0.24, HOUSE HUNTERS dropped 0.07 to 0.24, and HOUSE HUNTERS INTL was down 0.06 to 0.21. On ID, PERFECT MURDER shed 0.04 to 0.22. We’s BRAXTON FAMILY VALUES rose 0.02 to 0.20, and BOSSIP held at 0.11. Food Network’s BEAT BOBBY FLAY fell 0.08 to 0.16, and BITE CLUB was down 0.09 to 0.13. BET’s THE GRAND HUSTLE fell 0.05 to 0.10. CMT’s DALLAS COWBOYS CHEERLEADERS ticked down to 0.09. POP’s IMPACT WRESTLING ticked up to 0.06.